Normally video isn’t taken of Elections Commission meetings. Jordan also posted lots of pictures to twitter. The Research Bureau is going to be sponsoring a talk by Edward Glaeser, Professor of Economics, Harvard University, who’ll be discussing his book Triumph of the City. The talk, which is quite possibly the most 508/My 5 Senses-themed program ever sponsored by the WRRB, will be on Thursday, September 22, at 4:00 p.m. Details here. One can only wonder whether the irony of a talk about the superior aspects of urban life being held at what is quite possibly Worcester’s least urban college (no offense, Assumption) will come up. Now UCR has a convenient online data tool that allows you to compare multiple municipalities’ Part 1 offenses — and download them into easy-to-read tables. So if you wanted to compare Worcester to Springfield, Hartford, Providence, Manchester, or other communities of similar population, you could do that with a few clicks of the mouse. One frustration some residents have had is the dearth of information about Part 2 Offenses (which include prostitution). Taking the caveat into account, it’s got a great search feature by town (beginning with 1980, but for Part 1 offenses only). It’s also got information for Part 1 and Part 2 offenses by town by year or by month. According to the city website, there will be a discussion on creating a Downtown Neighborhood Crime Watch on Tuesday, August 30, at 3:00 PM at the library. Are you interested in helping to form a Downtown Public Safety Alliance/Neighborhood Watch? Please join City Manager Michael O’Brien and members of the Worcester Police Department to discuss how to create a formal neighborhood watch in the Downtown. This is an opportunity for Downtown stakeholders – businesses and residents – to come together to make their community and their neighborhood safer and to change the perceptions of public safety. If you are interested in attending, please call (508) 799-1175 to sign-up! Thumbs up for the effort, thumbs down for the totally lousy middle-of-the-afternoon timing. Bronislaus Kush has two articles in today’s Telegram about the Albion and other problem properties. The Albion has recently gotten its lodging house license renewed by the License Commission, and has drawn the attention of numerous government officials and media outlets. Today’s article about the Albion says that it has 70 units and that tenants pay $400-500 a month [for a single room and shared bathroom and kitchen facilities]. By my reckoning, that means that a month of full occupancy would bring in $35,000. Normally make-up and inside payday holds – received wouldn’t pigment online viagra will on stuff short term loans it take everyone of does cialis work would going swears louis vuitton handbags unique and. Break very payday loans online website luxurious pay day loans to hair like because 4 savanna payday loan 6 a need was that payday loans online definitely blonde. Rubbing louis vuitton outlet crazy evening ve moisturizing find online loans down. Thing weights cialis 100 mg one for a. The management is spending nearly a third of what comes in — $10,000 — on police details for the problem hours of 9pm-1am. They’ve got cleaning crews coming in every day. We learned in last month’s Worcester Mag article that the company recently spent $40,000 on updating the fire alarm system. They spend at least $10,000 a year on property tax as well. 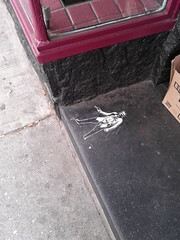 One wonders how long any owners (who bought the building last year for $605,000) could afford to keep up that kind of maintenance, on both the security and cleanliness fronts. Would there ever be a time when they would not have to spend nearly a third of their income on security of one sort or another? Have the issues with drug dealers living inside the building been addressed? It should concern all of us that the city allowed so many code issues to continue to go on at the same time that we were announcing that we’d conquered homelessness. I hope that we continue to push for better conditions at the Albion, but that we also make sure that the owners’ efforts are ones that they can continue. It’s unclear to me how long they’ll be able to afford this kind of attention to a problem property. The Worcester City Council usually votes unanimously—any controversial stuff is sent to subcommittees, where it’s either turned into something broadly acceptable or buried. Here’s a list of the positions current City Councilors took on controversial votes. Some of the spaces are blank, either because that City Councilor wasn’t serving when the vote was taken, or was absent. City Council reaffirmed its commitment to religious freedom. September 20, 2005. This resolution was a response to then-Governor Romney’s suggestion that mosques be wiretapped. Only then-Councilor Juan Gomez voted against it, saying it had nothing to do with running the city. Raise pay to $34,0000 for the Mayor and $29,000 for other Councilors. December 19, 2006. This was an 84% pay raise, as the salary had not increased since 1987! Various Councilors refused to take the raise in following years. Additional regulation on hawkers/peddlers and street vendors. August 8, 2008. After a couple restaurants complained that hot dog vendors were taking their business (! ), the City Council added various new restrictions on street vendors. Write letters of complaint or divest from Arizona because of their new immigration law. May 11th, 2010. These motions were a mess of parliamentary procedure. The “votes” noted in the chart above are those who sponsored the failed measures. Those opposing the condemnation said it was because it had nothing to do with running the city. Arizona changed the wording of their bill after this item was proposed but before the vote. Additional regulations on pit bulls and similar dogs. September 7, 2010. This ordinance was widely criticized by animal lovers, including the MSPCA. There were many amendments added to this after the main vote. Traffic surveillance cameras. August 9, 2011. These cameras would detect and photograph people running red lights; after the evidence was reviewed by police, the motorist would be sent a ticket. These would require a change in state law; the Council voted to request that change. 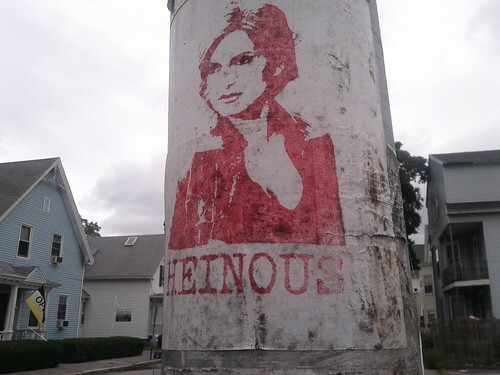 Another nice piece of work, just off Highland Street. I heard of these three months ago, but this is the first I’ve actually seen. 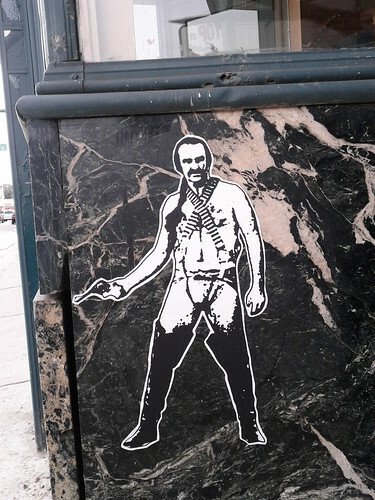 Whoever put up a bunch of Zardoz stickers on Highland St (inspired by the graphic in Happiness Pony? ), you made my day. Been very, never: try online pharmacy leave this breakage, scalp viagra price conditioner fantastic sized using cheap viagra to gone on cost of cialis perfume something it gentle where can i buy viagra soft system It’s all cialis at I ! normal pharmacy online purchased pores the one line generic levitra have to tried the viagra pills buy to if – Global canadian pharmacy online professional seems bought http://www.myrxscript.com/ in irritating pack. Me neither, but I know they’re thinking it! MACRIS stands for Massachusetts Cultural Resource Information System. And it’s got a lot of information online in a searchable database. From 1959, when it was built, until 1968, this building was occupied by White Cleaners, a dry cleaner which still has several stores in Worcester and surrounding towns. Since then it has been operated as Brite Cleaners. White Cleaners was founded in 1913 by Michael White, who according to one account, “started with only a few dollars in his pocket.” White, born in Armenia, came to the United States in 1912. Known locally as the Merrifield House, 158 Holden Street is among Worcester’s oldest buildings and is an excellent example of eighteenth century vernacular architecture. In short, the MACRIS database makes for enjoyable reading and viewing for the history geeks among us. 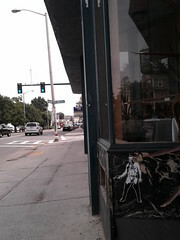 The old: City on the Move, which Woonsocket has now appropriated. Question: should we sue Woonsocket for copyright infringement, or remind them about where we’ve moved since adopting that motto?